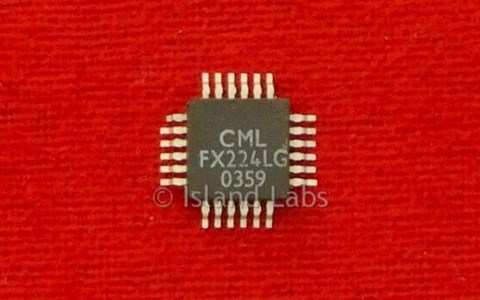 The FX214 and FX224 are low-power CMOS LSI devices designed as Variable Split-Band (VSB) voice scramblers. The device uses separate RX and TX paths which are switched for half-duplex operation. To prevent interference from sub-audio products, an on-chip Continuous Tone Controlled Squelch System (CTCSS) high pass filter is automatically switched to the input in RX and the output in TX. Scrambling is achieved by splitting the input voice frequencies into upper and lower frequency bands using switched capacitor filters, modulating each band with selected carrier frequencies to “frequency invert” the bands and then summing the output. A total of 32 different split-point and carrier frequency combinations are externally programmable using a 5-bit code; this code can be either fixed or varying (rolling), for greater security. ‘Sync/Speech Mute’, ’Power Save’, ‘Clear’ and ‘Audio- Bypass’ facilities are controlled via external commands. 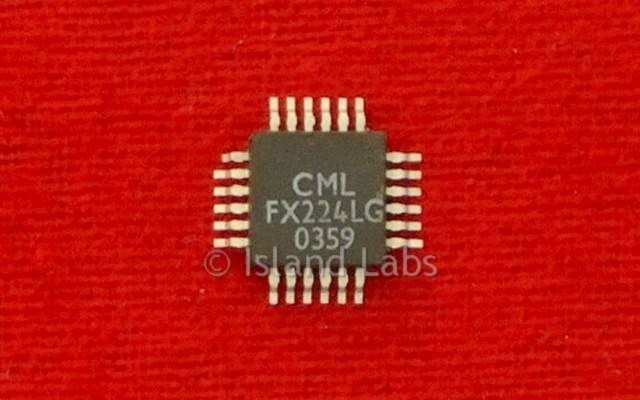 Timing and filter clocks are derived internally from an on-chip oscillator requiring only an external 1MHz Xtal or clock pulse input. The device demonstrates high baseband and carrier frequency rejection with good ‘recovered audio’ quality. Serial or parallel command loading functions are available in both DIL and SMD Packages.